This image was created with the Canon 70-200mm f/2.8L IS II lens (hand held at 200mm) and the Canon EOS-1D Mark IV. ISO 50. Evaluative metering +2/3 stop: 1/4 sec. at f/14 in Tv Mode. Central Sensor/AI Servo Rear Focus and release. Click here if you missed the Rear Focus Tutorial. Lens/camera body Micro-adjustment: -10. The image is presented here for your critique; feel free to praise it or rip it to shreds. Would you keep it or delete it? Let us know why either way, what you like or what you hate. What would you have done differently? Over the course of the next week or so I will present two additional images in this series for a total of twenty in all. The last will be followed by several revelations including two major ones. Nice one! Almost looks like flames! Interesting. Love the colors. Would really love to see the original sans blur. 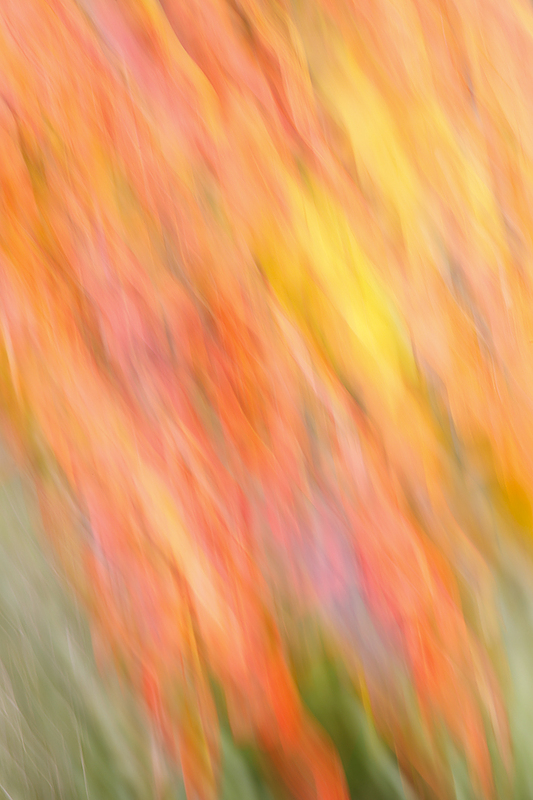 I also tried getting autumn colors blurred while my husband drove the car 60 mph & I aimed my camera up into the woods with a slow camera speed. It took several tries to get a good one. It’s great when a photographer renowned for tack-sharp images is willing to stretch out and experiment with impressionistic blurs, panning, and all that stuff! Good lesson for all of us. A nice patch of soft blurred colors! I like it!